There was an old baseball saying with the Boston Red Sox in the 1940s when they had two decent pitchers in Warren Spahn and Johnny Sain. It went "Spah, Sain and pray for rain." That's the depth-challenged WWE right now. It's Lesnar-Reigns and pray for Kane. The end of the go-home show for the Royal Rumble had Lesnar laying prone after being left for dead by the Wyatt Family, who have been stuck in the midcard since Thanksgiving. Reigns will be the #1 entrant in the Royal Rumble, which was determined in a segment that will live on through Botchamania. Vince McMahon, he of the bulging biceps at 70, failed to open two plastic balls on live television. Basically, the segment wanted you to believe the Authority rigged the drawing to make sure Reigns would draw the first spot. In other words, this was the WWE version of the 1985 NBA Draft lottery. Roman Reigns came out first to say he was going to be the first man ever to defend the WWE World Heavyweight Championship in the Royal Rumble, but he was only concerned with Brock Lesnar tonight. He wanted Lesnar to come out. Chris Jericho walked down and said Lesnar was already booked for the Highlight Reel tonight and asked Reigns to join him. Reigns agreed. Then the League of Nations came out, with Alberto Del Rio back with the U.S. Championship around his waist. Sheamus objected to everyone assuming the Royal Rumble will just come down to Reigns vs. Lesnar. Sheamus said the WWE Championship would come home to him. Sheamus wanted to be on the Highlight Reel, but Jericho shot him down. Del Rio objected to Jerichio's smarky remarks and bragged about how he won the Royal Rumble, unlike Jericho. Jericho declined both of their invitations. Rusev then launched into a diatribe about how hard is was to grow up in Bulgaria. Jericho quizzed Reigns about how he won the Royal Rumble last year, and Reigns recalled he threw out Rusev to win. Jericho got off a line about how Lana can attest how Rusev always comes up short in the big moments. Reigns wanted to face Rusev, and Jericho announced he would be special referee. Match built to a spot where Sheamus pulled Reigns out of the ring and threw him into the ringpost. Even though he was distracted by King Barrett, Jericho sensed what happened and forced Sheamus away from ringside. Then Barrett protested and Jericho ordered him to the back. Jericho turned cartwheels, danced and appeared to blow himself up in the process. Del Rio protested and he also was ejected. Rusev tried to hit Jericho from behind but Reigns intercepted that with a Superman's punch and the pin. In the back, Stephanie McMahon (wearing the highest heels possible so she can appear almost as tall as Jericho) confronted Jericho about making himslef special referee. She said because Reigns is now part of the Highlight Reel, she would have to renegotiate with Paul Heyman and give Lesnar more money. She said if Jericho ever did anything without her approval, she would make sure Jericho would never be the same again. Natalya won with the sharpshooter. Natalya was accompanied by Paige. Wasn't it Paige who jumped Natalya in December, causing her to miss months of action? Paige just walked out like they were best friends. Announcers just talked how this match was a preview for the season debut of Total Divas. Braun Strowman distracted Ryabck, which allowed Bray Wyatt to clothesline him from behind on the floor. Bubba Ray Dudley called for the 3-D, and it was sad. Crowd was so dead it couldn't get a pop. Luke Harper pinned Bubba Ray with a clothesline. Everybody involved in this feels like they're going nowhere. JBL and Michael Cole mentioned the death of Iron Mike Sharpe during the match. There will be a drawing later tonight to determine the number one slot in the Royal Rumble. I thought when the Big Show entered himself in the Rumble he made himself number one, but apparently that was a screwup on his point. Show pinned Heath Slater with the Knockout punch. They took an overhead shot of the arena as Slater got in the ring, and you could see people headed to the bathrooms or concession stands. Afterwards, fellow Social Outcasts members Curtis Axel and Adam Rose got knocked out. Bo Dallas ran in the ring and ducked a punch, then started to take a victory lap around the ring thinking he got away. As he finished his lap, Show decked him as well. Byron Saxton said Big Show was "A favorite to win the Rumble." Services for Mr. Saxton's credibility will be held Friday at 9 AM. Stephanie met with the League of Nations backstage. She wanted to know why they let Jericho scare them into leaving ringside back when this show had momentum...I mean during the first match. Sheamus said they weren't scared of Jericho. She told them to prove it. Stephanie and Vince McMahon came out to draw the numbers for the number one position in the Royal Rumble. Since it was a lottery, a representative from the Philadelphia 76ers showed up. Stephanie mentioned how her father won the Royal Rumble was the 1999 Royal Rumble champion. Vince pulled out the first plastic ball...and couldn't open it. So he threw it back and picked up another one out of the tub, revealing the name of Reigns. So Vince wanted to make sure the drawing was legit and drew another ball. He couldn't open that one. Keep in mind, moments earlier Stephanie had talked about what a great physical specimen her father was. Stephanie dropped in a "McMahon's Millions" reference, at this point. So Vince pulled out a ball, which again had "Reigns" in there. They drew a third number, basically to tell the audience that the Authority had rigged the drawing to make sure Reigns would get #1, and again Reigns' name was in there. Vince mentioned that Reigns would be the number one man on Sunday, but not after the Royal Rumble. Becky Lynch won with the Disarm-her off the top rope. Afterwards, Lynch wanted to hear from Charlotte's mouth that they would meet on Sunday at the Royal Rumble. Charlotte said she had already beaten Lynch twice and there wouldn't be a third match. Lynch said she only won because of Flair and said Flair never backed down from a challenge in his career. She tought Charlotte would be the same way, but perhaps the apple fell too far from the tree. Flair took the mic, called Charlotte the best of all time and said this Sunday, the third time would be the charm when Charlotte beats Lynch again. She accepted. Charlotte didn't look happy about that. Final minutes were good. Kevin Owens was on commentary, trying to make himself babyface by constantly telling Saxton to shut up. Kalisto hit Salida del Sol on Sheamus, but Del Rio hit a Superkick for the save. Dean Ambrose brawled with Del Rio at ringside, but was distracted by Owens. Del Rio hit Ambrose with an enzuigiri. In the ring, Kalisto tried another Salida del Sol on Sheamus, who threw Kalisto off and hit the Brogue Kick. In the comeback, Kalisto attempted a Tornado DDT on Sheamus that got fouled up, and it appeared Sheamus landed on his face. It's a Last Man Standing match with Ambrose vs. Owens for the I-C title on Sunday, which could steal the show. They showed pictures of the weekend tour from India, the company's first tour there since 2002. Isn't it amazing they never toured there when the Great Khali was on the roster? The New Day had a funeral service for Franchesca the trombone, which was destroyed by Jericho last week. Big E. presided over the service and started to quote Jay Z's "99 Problems" when Xaiver Woods stopped him. Kofi Kingston said they would buy him a new trombone. Woods said he never got a chance to say goodbye. Woods said Franchesca would want Big E. to fight Big E. and they started clapping and chanting "Fran-Ches-Ca." JBL was clapping, as well. They had a By the Numbers segment about the Royal Rumbles. In the 28 lifetime Royal Rumbles, 811 competitors have been eliminated, a record 42 by Kane. 46 WWE Hall of Famers have entered the Royal Rumble, but only 8 have won it, including Steve Austin 3 times. Rey Mysterio's 82:12 is the longest single stint ever in the Rumble. R-Truth, Titus O'Neal, and Mark Henry talked about one of them winning the Royal Rumble this Sunday. Neville joined in the handshake and they all yelled "Keep the Dream Alive." The League of Nations talked backstage. The announcers teased they would get involved in the Highlight Reel. Finishing sequence was supposed to be O'Neal tossing Tyler Breeze over his head to an awaiting Henry, who would deliver the World's Strongest Slam. Apparently, Henry lost Breeze in the lights because he dropped him. Then Breeze had to take the bump again, and it ended with Neville hitting the Red Arrow. Match really dragged until Neville and Breeze got in. The second they got in, they fell into their old rhythm like they were Stephen Curry and Klay Thompson. It's incredible how far Breeze's stock has fallen since he defeated Dolph Ziggler at Survivor Series. Yes, that was only 7 weeks ago. Jericho was out for the Highlight Reel when Heyman interrupted him. 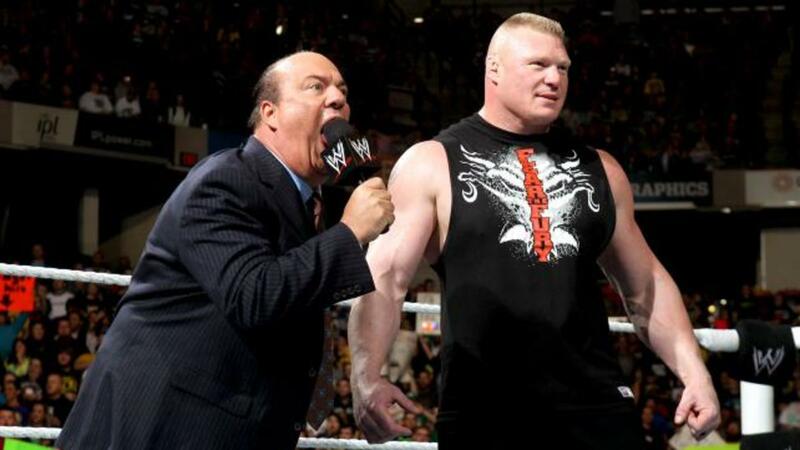 Jericho accused Heyman of failing his client, Lesnar, when he failed to get him out of the Royal Rumble last week. Jericho asked Heyman if he tried to get Lesnar out of the Rumble because he didn't feel he could win. Heyman, in a very long-winded way, denied that and said Lesnar would turn the Rumble into his own Suplex City. Jericho asked what would happen if it came down to only Jericho and Lesnar at the end of the Rumble on Sunday, and what would happen if Jericho threw Lesnar out to become a 7-time World Champion. Really wasn't much of a reaction to that line because it's been so long since Jericho has been a champion and a regular. This finally brought out Lesnar to a very tepid reaction. Reigns walked out after Lesnar got to ringside. Lesnar took a lap around the ring to buildup a showdown with Reigns. Once Lesnar got in the ring, Reigns immediately speared him. The League of Nations ran down to jump Reigns. Jericho vanished at this point. Lesnar gave Rusev a German Suplex. Del Rio and Sheamus ran after Lesnar. Boy did Del Rio and Lesnar have a confrontation that looked awkward. It appeared like Del Rio wanted to get a little offense in, and Lesnar wasn't willing. Lesnar ultimately gave Del Rio another German Suplex and Sheamus the F-5. At that point, Reigns got up and hit another spear on Lesnar, which got a few boos. Then the Wyatts came down to ringside, with Harper giving Reigns a clothesline. Wyatt gave Reigns Sister Abigail. At that point, Lesnar got up, and Harper gave him a big boot. Erick Rowan followed with a spin kick, Strowman hit Lesnar with a clothesline. Wyatt finished off Lesnar with another Sister Abigail. And that was it. No Lesnar comeback. No Reigns comeback. The entire show was built around the main event. Certainly it was strange to see the Wyatt Family, who have been on the backburner ever since the Undertaker/Kane feud at the Survivor Series, finish off the go-home show to the Royal Rumble standing over the company's top babyface. But beggers can't be choosy at this point. Not when the WWE needs top heels. Since they're unwilling to take chances on people like Breeze, they turn back to the Wyatts, though it seems like that well has run dry. It remains to be seen if the company can make Owens a money-drawing heel, or if they position him that way. It was another dead crowd tonight and a lackluster show overall.